What Does Equality Mean to a Conservative? 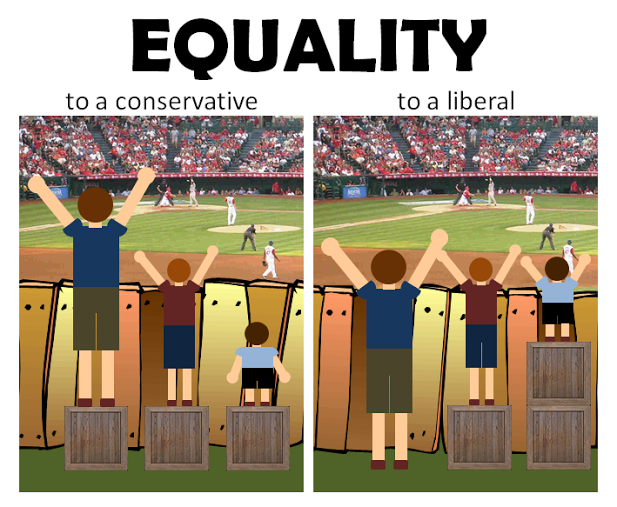 What Does Equality Mean to a Liberal? As a prolific blogger, liberal Democrat, staunch defender of human rights and civil liberties, I can’t begin to imagine how many hundreds of hours and thousands of words I have spent over the years trying to make the point that this simple picture makes so easily and cogently. Previous Previous post: You Know You Want It. You Deserve It. So Enjoy! I love this. Planning to share on fb. Thanks! Even as a conservative, I would agree with this picture.